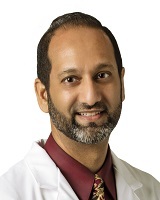 Dr. Malik grew up in Indianapolis, IN where he completed his training thru to the IU School of Medicine. He and his wife, Ausia, have three children and in his free time he is a voracious reader and history buff who likes to go biking and lift weights. He has devoted time to teaching and working with Muslim teenagers for over 15 years and has written for newspapers and blogs as well as participating in interfaith dialogue groups for many years. He has been in practice for over 17 years now and he loves being a physician and considers it a privilege to work in a profession that can make such a profound difference in people's lives every day.